Legendary Pictures has released a "360 video inspired by the Warcraft movie" offering a high-above, all-around view of the city of Stormwind, seen from the back of a soaringgryphon. Created by the famed Industrial Light and Magic, the results are pretty cool—although the seam directly behind the gryphon is very visible. It also requires Google's Chrome browser in order to operate; Kotaku says it "looks busted and broken" on other browsers, but on Firefox (at least, my Firefox) it just flat-out doesn't work. Don't have Chrome? Here you go. While you're here, have a look at the pair of movie posters released at the San Diego Comic Con and served up by Screen Rant, one featuring Sir Anduin Lothar, the knight in command of the human army, and the other, the great Orc chieftain Durotan. They both have the look of guys who'd rather be doing just about anything else, and as the site notes, there's an expectation that the film will forgo a simple good guy/bad guy narrative in favor of digging into the moral and political complexities of the Warcraft setting. 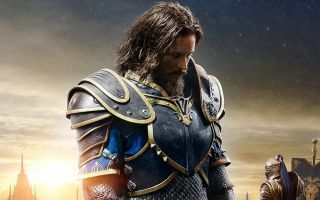 Director Duncan Jones stated late last week that, close to ten years after production first began, the Warcraft film is "pretty much a finished movie." It's slated to hit screens in June of 2016.